Nearly one-third of American adults have high blood pressure, and one-third have high cholesterol, according to the Centers for Disease Control and Prevention. Both of these conditions are risk factors for heart disease, which is the leading cause of death in the United States. A healthy lifestyle can help you lower high blood pressure and cholesterol, and you can carefully craft smoothies that fit into a heart-healthy diet. Most kinds of fruit are rich in dietary fiber, which is an indigestible form of carbohydrates in plant-based foods. Dietary fiber can lower cholesterol levels, and eating high-fiber foods can help prevent heart disease. Fruit is also high in potassium, which is an essential mineral that helps lower blood pressure by opposing the blood pressure-raising effects of sodium. Add bananas or fresh or frozen berries, mangos, peaches or cantaloupe to your smoothies. Individuals who consume at least three servings of dairy products per day tend to have lower blood pressure and a lower risk for heart disease, according to research published in the April 2013 edition of the "Nutrition Reviews" journal. Plain regular or Greek yogurt can thicken smoothies and help you reach your daily recommended consumption of dairy products. Choose fat-free yogurt to limit your consumption of cholesterol-raising saturated fat. Obesity is a risk factor for high blood pressure and high cholesterol, and smoothies can contribute to these health conditions if they add excessive calories to your diet. Consume smoothies as replacements for meals instead of as accompaniments, and avoid adding unnecessary calories from added sugars. Choose unsweetened frozen fruit instead of sweetened, and use plain yogurt instead of options that contain sugar or corn syrup as sweeteners. 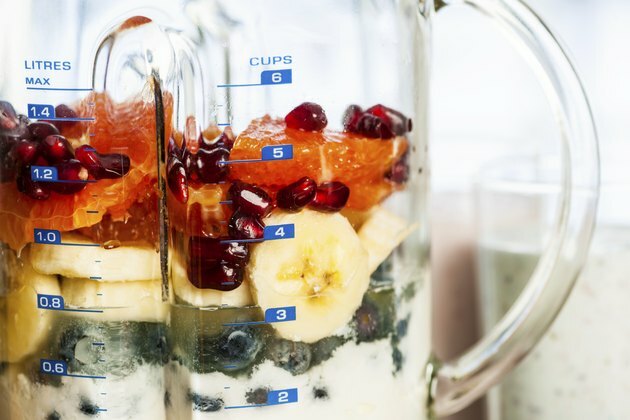 Blend ice into your smoothies to make them bigger without adding calories. Vegetables provide potassium and dietary fiber, and they can protect against high blood pressure and high cholesterol. They are also low in calories and support a healthy weight. Add carrots, beets, kale and broccoli to your smoothies to increase their health benefits. Also consider adding a source of healthy fat, since unsaturated fats can help lower cholesterol, according to the Centers for Disease Control and Prevention. Add a small amount of peanut butter or flaxseed for a nutritious smoothie. What Foods to Eat to Gain Weight Quickly?